The compound also yields difluorocarbene upon treatment with strong base and is used in the laboratory as a source of this reactive intermediate. The pyrolysis of R-22 in the presence of chlorofluoromethane gives hexafluorobenzene. R-22 is often used as an alternative to the highly ozone-depleting CFC-11 and CFC-12, because of its relatively low ozone depletion potential of 0.055, among the lowest for chlorine-containing haloalkanes. However, even this lower ozone depletion potential is no longer considered acceptable. As an additional environmental concern, R-22 is a powerful greenhouse gas with a global warming potential equal to 1810 (which indicates 1810 times as powerful as carbon dioxide). Hydrofluorocarbons (HFCs) are often substituted for R-22 because of their lower Ozone Depleting Potential, but these refrigerants also have high larger global warming potential. R-410A, for example, is often substituted, but has a Global Warming Potential of 1725. Another substitute is R404A with a Global Warming Potential of 3900. Other substitute refrigerants are available with low Global Warming Potential. Ammonia (R717), popular in the early years of refrigeration, has a Global Warming Potential of <1 and remains a popular substitute on fishing vessels. Ammonia’s toxicity and flammability limit it’s safe application. Propane (R-290), is another example, and has a Global Warming Potential of 3. Propane was the de facto refrigerant in systems smaller than industrial scale before the introduction of CFCs. Propane refrigerator’s reputation as a fire hazard kept delivered ice and the ice box the overwhelming consumer choice despite its inconvenience and higher cost until safe CFC systems overcame the negative perceptions of refrigerators. Illegal to use as a refrigerant for decades, propane is now permitted for use in limited mass suitable for small refrigerators. It is not lawful to use in air conditioners, or larger refrigerators because of its flammability and potential for explosion. Since January 1, 2010, it has been illegal to use newly manufactured HCFCs to service refrigeration and air-conditioning equipment - only reclaimed and recycled HCFCs may be used. In practice this means that the gas has to be removed from the equipment before servicing and replaced afterwards, rather than refilling with new gas. Since January 1, 2015, it has been illegal to use any HCFCs to service refrigeration and air-conditioning equipment; broken equipment that used HCFC refrigerants must be replaced with equipment that does not use them. 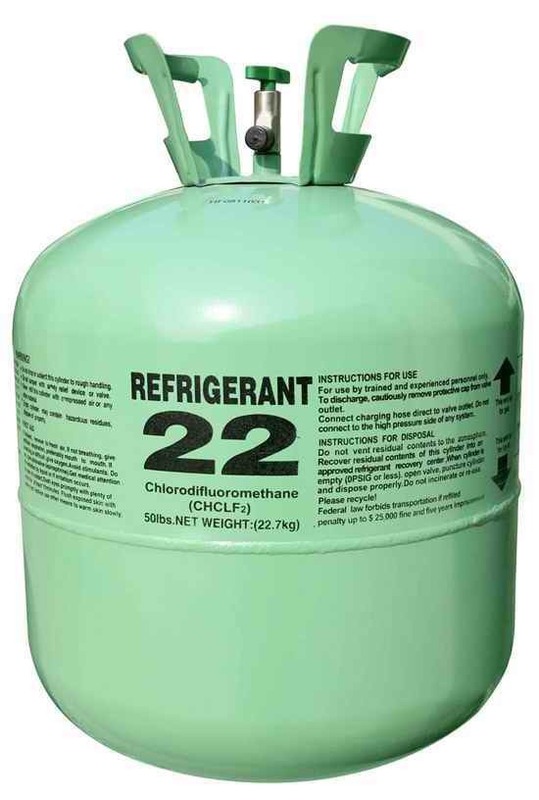 R-22 has been mostly phased out in new equipment in the United States under the Montreal Protocol, and has been replaced by other refrigerants with lower ozone depletion potential such as propane (R-290), pentafluoroethane, R-134a (1,1,1,2-tetrafluoroethane), and blended mixtures of HFCs such as R-409A, R-410A, R-438A, and R-507A. See refrigerant for specific components of the R-400 and R-500 HFC blends used to replace R-22. Beginning January 1, 2004: The Montreal Protocol required the U.S. to reduce its consumption of HCFCs by 35% below the U.S. baseline cap. As of January 1, 2003, the United States Environmental Protection Agency banned production and import of HCFC-141b, the most ozone-destructive HCFC. This action allowed the United States to meet its obligations under the Montreal Protocol. EPA was able to issue 100% of company baseline allowances for production and import of HCFC-22 and HCFC-142b. Beginning January 1, 2010: The Montreal Protocol required the U.S. to reduce its consumption of HCFCs by 75% below the U.S. baseline. Allowance holders may only produce or import HCFC-22 to service existing equipment. Virgin R-22 may not be used in new equipment. As a result, heating, ventilation and air-conditioning (HVAC) system manufacturers may not produce new air conditioners and heat pumps containing R-22. Beginning January 1, 2015: The Montreal Protocol required the U.S. to reduce its consumption of HCFCs by 90% below the U.S. baseline. Beginning January 1, 2020: The Montreal Protocol requires the U.S. to reduce its consumption of HCFCs by 99.5% below the U.S. baseline. Refrigerant that has been recovered and recycled/reclaimed will be allowed beyond 2020 to service existing systems, but chemical manufacturers will no longer be able to produce R-22 to service existing air conditioners and heat pumps. R-407A is for use in for low- and medium-temp refrigeration. Uses a polyolester (POE) oil. R-407C is for use in air conditioning. Uses a minimum of 20 percent POE oil. R-407F is for use in medium- and low-temperature refrigeration applications (supermarkets, cold storage, and process refrigeration); direct expansion system design only. Uses a POE oil. R-407H is for use in medium- and low-temperature refrigeration applications (supermarkets, cold storage, and process refrigeration); direct expansion system design only. Uses a POE oil. R-421A is for use in “air conditioning split systems, heat pumps, supermarket pak systems, dairy chillers, reach-in storage, bakery applications, refrigerated transport, self-contained display cabinets, and walk-in coolers.” Uses mineral oil (MO), Alkylbenzene (AB), and POE. R-422B is for use in low-, medium-, and high-temperature applications. It is not recommended for use in flooded applications. R-422C is for use in medium- and low-temperature applications. The TXV power element will need to be changed to a 404A/507A element and critical seals (elastomers) may need to be replaced. R-422D is for use in low-temp applications, and is mineral oil compatible. R-424A is for use in air conditioning as well as medium-temp refrigeration temperature ranges of 20 to 50˚F. It works with MO, alkylbenzenes (AB), and POE oils. R-427A is for use in air conditioning and refrigeration applications. It does not require all the mineral oil to be removed. It works with MO, AB, and POE oils. R-434A is for use in water cooled and process chillers for air conditioning and medium- and low-temperature applications. It works with MO, AB, and POE oils. R-32 or HFC-32 (difluoromethane) is for use in air conditioning and refrigeration applications. it has zero ozone depletion potential (ODP)  and a global warming potential (GWP) index 675 times that of carbon dioxide. It has two allotropes: crystalline II below 59 K and crystalline I above 59 K to 115.73 K.
Next diagram represents the pressure-enthalpy R22 properties, using Refprop 9.0 database, using the International Institute of Refrigeration reference. EPA's analysis indicated the amount of existing inventory was between 22,700 MT (metric tons) and 45,400 MT. In 2012 the EPA reduced the amount of R-22 by 45%, causing the price to rise by more than 300%. For 2013, the EPA has reduced the amount of R-22 by 29%. ^ a b c d e NIOSH Pocket Guide to Chemical Hazards. "#0124". National Institute for Occupational Safety and Health (NIOSH). ^ a b Rosenthal, Elisabeth; Lehren, Andrew W. (June 20, 2012). "Relief in Every Window, but Global Worry Too". The New York Times. Archived from the original on June 21, 2012. Retrieved June 21, 2012. ^ "This page has moved". www2.dupont.com. Archived from the original on 16 May 2015. Retrieved 23 April 2018. ^ "Frogen® R-22 - Frogen UK: Refrigerant and Cooling Specialists". frogen.co.uk. Archived from the original on 25 January 2017. Retrieved 23 April 2018. ^ "Protection of Stratospheric Ozone: Adjustments to the Allowance System for Controlling HCFC Production, Import, and Export". federalregister.gov. 3 April 2013. Archived from the original on 4 March 2016. Retrieved 23 April 2018.